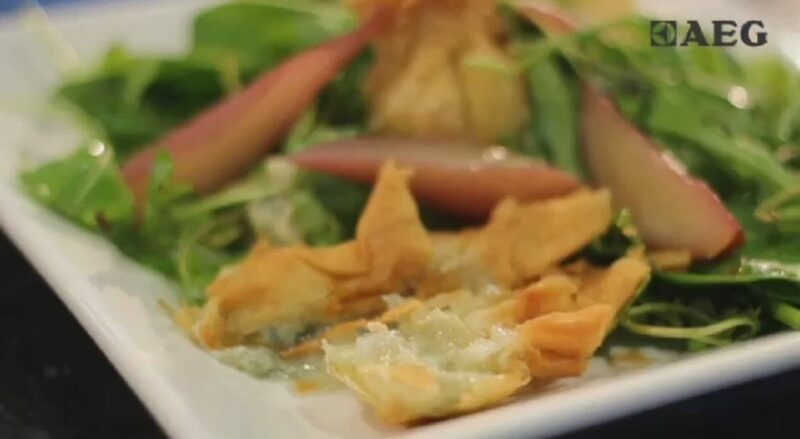 The video shows how to make the blue cheese filo parcels -easy and quick. This dish is an unusual combination of flavours that works amazingly well. There’s a great tip for using filo pastry – just cover the sheets with a damp tea towel until you’re ready to use. Filo is easy to use but if it dries out you cannot fold it, it will just break apart. If it does dry, painting with warm melted butter will sometimes soften it up again. Cooking pears in wine is quite common but the addition of a cinnamon stick and star anise transforms the taste again. Peel and quarter the pears, core them and poach in the red wine with a splash of water, cinnamon stick and star anise. Take most of the cheese and form into balls. Place one on each sheet of pastry and then form into parcels as shown in the video. Deep fry the blue cheese parcels. Make up your salad dressing. Salad dressing will keep well in a sealed jar in the fridge. Make up your salad and dress. Place the salad on a serving dish. 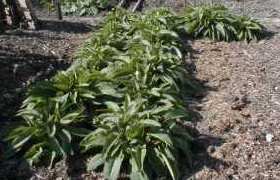 Add the blue cheese parcels and spiced pears onto the leaves.